There is no denying it. 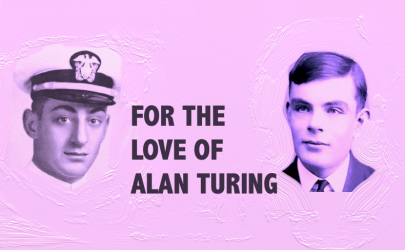 Alan Mathison Turing, one of the most magnificent beings to grace this planet, was treated most shabbily and we cannot even begin to comprehend the repercussions of his loss. But that does not mean that he wanted to be remembered as a tragic figure. Yet time and time again on Twitter, in movies, it is his torture and his end that is given so much prominence. You don’t have to hold up the man who pretty much stopped World War II, invented artificial intelligence and won marathons to make the rather obvious point that no human should be persecuted for acts of love between consenting adults. A crime against a person of lesser fame is no less a crime. Alan, I think, would cringe at being thought of as a gay martyr. But he would be thrilled at being remembered for his pride at being a “queer” man. He writes in his short story that he liked to parade his homosexuality. He also took a distinct thrill in being a gay codebreaking warrior against a regime that forbade to employ gay codebreakers. He enjoyed the risk involved in partaking in an illicit subculture. Alan would also have liked to be remembered as a free-thinker with a fierce code of ethics, as a decent chef and baker, and as a lover of maths and games, for his kindness to others and for his ability to give wise counsel in a wide range of fields. On June 7, 2017, the 63rd anniversity of Alan’s transition to another realm, let’s honor Alan’s equally beautiful mind and heart and study closely how he broke the Enigma, consider his idea of the Turing Machine and his brilliant work on morphogenesis. Explore too all that he thought might be possible with artificial intelligence. In contrast with this rather cold world of Big data, Fintech, Internet of Things, Machine learning and Deep learning, Alan retained a sense of humanism in his wonder in how a computer might enjoy strawberries and cream, how one might have a meangful conversation with a computer, how a computer might create music or write poetry. Alan was no bible-thumper by any stretch of the term, but I think he might have liked that quotation. His light will never go out. The best source of Alan on the Internet is the Alan Turing Scrapbook., which will give you access to many of these papers. I love and miss you every day, Alan! Previous PostPrevious Chechnya — What Would Harvey Do?